DAVID Vaughan insists the onus is on Sunderland’s new-look midfield to keep their established rivals at bay. All four of Sunderland’s middlemen in yesterday’s emphatic 4-0 victory over previously unbeaten Stoke City were signed by Steve Bruce during the summer, albeit right winger Ahmed Elmohamady spent last season at the Stadium of Light on loan. Full debutant Vaughan starred alongside the equally impressive Craig Gardner in central midfield and thoroughly justified Bruce’s decision to relegate skipper Lee Cattermole and fellow ever-present Jack Colback to the bench. But after enduring a frustrating spell among the substitutes during the early stages of his Sunderland career, the softly-spoken Vaughan is in no mood to return there and knows standards must be maintained. Vaughan told the Echo: “There’s three or four really good central midfielders at the club and we’re always fighting for our places. “It was a totally new midfield from last season. Hopefully we can keep putting in performances and winning games. “It’s down to me to play well and stay in the team really. I like to get on the ball and try to keep things ticking over and get it forward as much as possible. “It’s been a bit of a wait for my debut, but it was a great result and an important game to win. “I was pleased with the way I played and the way the team did as well. “It’s been frustrating to be on the bench, but sometimes you’ve just got to wait. It doesn’t always go to plan. Welsh international Vaughan caught the eye as Sunderland’s wait for a first win of the season came to an end, although there were positive performances all over the park from Bruce’s side. 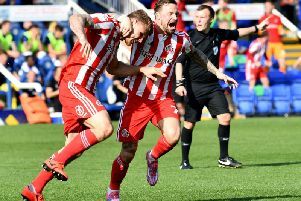 Three goals in the opening 28 minutes provided the perfect tonic to Sunderland’s troubles, even if they received a hefty slice of fortune from Stoke’s jittery defence. In contrast, Sunderland’s back four was resilient as they dealt with the aerial threat of the Potters. Vaughan added: “It was a crucial win for us. A lot of teams at the bottom picked up three points on Saturday so we didn’t want to get cast adrift. “It was important for the confidence of the lads to get the early goal and for the crowd as well. And then to be 3-0 up after 30 minutes, was great. “We had a bit of luck on our side with the second and third goals and then Seb (Larsson) has got a great set-piece delivery, you almost expect him to score from those. “We looked solid at the back too. Most of the season, we’ve looked solid anyway, we’ve just struggled with scoring goals.